Aswan is the ancient city of Swen or Swenet, which in antiquity was the frontier town of Egypt facing the south. For centuries, it was the gateway to Africa and the lands of Nubia. The Copts called it ‘Souan’, meaning ‘trade’, from which the present-day Aswan is derived. Nowadays, it is the third largest city in Egypt, and the biggest in Upper Egypt! Ancient Aswan was located on the main trading route between Egypt and the southern lands, where gold, silver, ivory, animal skins, camels and caravans passed into Egypt. The ancient city was also famous for its granite quarries. Thousands of Egyptian statues, obelisks, shrines and even pyramids are constructed out of the granite mined in Aswan. The strategic city of Aswan was also a crucial military base of the ancient Egypt. In Aswan the Nile is at its most beautiful, flowing through amber desert and granite rocks, round emerald islands covered in palm groves and tropical plants. The population here mostly consists of Nubians and local tribes of Kenzo. The city became very important after the construction of the high dam and the worldwide rescue campaign of the Nubian monuments during and after its construction. Elephantine is located in the centre of the Nile at Aswan. The island is said to gain its name from the shape of its bulbous rocks that resemble elephants (yebu). The island is also believed to have had elephants or it was a centre of ivory trading. 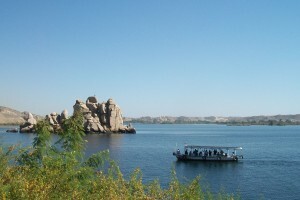 Elephantine is Aswan’ largest island. It used to have an important role back since the Old Kingdom. It is a beautiful place to visit, with wonderful gardens and some truly significant artefacts. It is also a good place to spend some leisure time, wondering among the three Nubian villages where the people are friendly and the houses are often very colourful. This museum, also called Aswan Museum, houses the antiquities found in the island, like utensils, weapons, statues, pottery and mummies. Some of the more notable exhibitions at the museum include a mummified Ram of Khnum, a golden bust of Khnum, statues of Amenhotep 3 with goddesses and prehistoric schist basins. Also on display are statues found in Hekayib’ sanctuary including a recumbent statue of Sarenput 2, a 12th dynasty governor of the island. Probably one of the most interesting structures on the island, just in front of the museum, is the Nilometer. This was one of the earliest known nilometers and was used by the ancient Egyptians to measure the height of the Nile floods in order to forecast the level of inundation and so gauge taxes for the coming harvest. This stone staircase with 90 steps lead steeply down to the river from the entrance, with depth markings along the walls. The Nubian Museum is situated on the southern end of Elephantine Island and features Nubian treasures recovered from tombs, temples and settlements before the flooding of Nubia. The museum is designed by the late Egyptian architect Mahmoud el Hakim. The Mexican architect Pedro Vasquez designed the museum’s interior display. The architecture of the museum and the enclosure walls are intended to evoke traditional Nubian village architecture, as it was along the Nubian Nile before the region was flooded by Lake Nasser. The building is set within a landscape, in graded levels, that included a sequence of waterfalls. When the waterway reaches the lower part of the garden, it divides into two branches to surround an open-air stage and amphitheatre. The area has been planted with palm trees, flowers and climbing plants, spread over natural rocks. It is partly an open-air museum where the visitor can wander the paths, meandering between a prehistoric cave with painted rock-art, ancient Egyptian statues, obelisks and columns, Roman frescoes and even a complete Nubian house. A step pyramid can be seen on the northern edge of the monumental area. It is a solid granite structure bound with a clay mortar that dates back to the 3rd dynasty of the Old Kingdom. Like most the other small pyramids, it seems to be aligned with the Nile River, and was built on a rock plateau that had been worked specifically as a foundation. This temples, dedicated to the ram-headed creator-god Khnum, is mostly in ruins. Its remains can be found at the southern end of the island. A number of obelisks and monument have been reconstructed on the parapet. A granite gateway with carvings of Alexander 4 is the only large structure of the temple which remains intact. At the front of the temple, which is oriented east to west, a pavement surrounds fragmentary remains of columns built by Ramses 2. This leads down to a Roman quay. There is little to be seen of the interior of the Temple of Khnum, but a large square granite gateway begun by Nectanebo 2 is one of the few surviving structures. There are a few remains of pillars which where painted by the Romans and several altars with Greek inscriptions. The Temple of Satis (the goddess who ‘let fly the current with the force of an arrow’), the consort of Khnum, is a fine example of modern restoration techniques. The reconstruction by the German Archaeological Institute has been sensitively done, with the few reliefs supplemented by drawn elements. The temple was built over Middle Kingdom remains beneath different floor levels and also a Dynasty 6 temple. The latest structure to emerge from the excavations at the Satis Temple is an Early Dynastic shrine which can be seen in a crypt-like area below the reconstructed temple, and this must be one of the earliest remaining temples in Egypt. This temple has some fascinating reliefs. Pepynakht Hekayib was a governor and ‘overseer of foreign lands’ during the long reign of the 6th dynasty Pharaoh Pepi 2. His tomb is simple but significant. It is approached through a stairway that opens to a small two-pillared hall then to an inclined passage used for burial. Inscriptions in the tomb describe the career of Hekayib. He was a judge and administrator. He then took charge of quelling Nubian revolts and later rebellions in Asia. From the tomb of Hekayib an entrance door lead to the tomb of Sabni, Hekayib’s son. Originally the island was dwelled by the Nubian population who gave the island the name of ‘Jet Narty’. A good agriculture system was developed with good results, thanks to two water-mills: one on the eastern side of the island and the other on the western side. In 1899, Lord Kitchener took possession of the island and made it a place for rest and headquarters during his military campaigns in the Sudan. Then the island was named ‘Lords House’, but it is now better known as Kitchener’ Island. The collection on this island were begun by Lord Kitchener and expanded since. Kitchener’ Island is a natural treasure of oval shape and covers an area of 6,8 hectare. The botanical garden is divided into 27 squares with veridical and horizontal paths cutting each other making it like a chess board. Paths have been designed on the ground and paved with Aswan granite. The main one, in the centre of the garden, is paved with pink granite; it is nice and shadowed by two long rows of royal palms white like marble. There is huge variety of tropical and subtropical plants and trees at the island some of which are naturally found on the island before it was converted into Botanical Island and others have been brought in. There are number of very rare palm trees, such as the Royal Palm tree, the Sabal Palm tree and the phonic Pam tree. Thanks to its position, the quietness the island is also a refuge for many species of exotic birds, which makes it also a good site for bird watching. Ardent bird watchers can grab their binoculars and scout for King Fishers, Malachite King Fishers, little green Bee Eaters, Nile Valley Sunbirds, shrikes, warblers, wheatears, egrets, or perhaps larger waterfowls like Purple Gallinule. The island and gardens can be reached by felucca, motorboat or one of the local ferries. Philae Island was a rocky island in the middle of the River Nile, south of Aswan. The well-known name of Philae is Greek. The ancient name of this island was P-aaleq, meaning ‘End’ or ‘Remote Place’, which later turned into the Coptic ‘Pilak’. Another meaning of the ancient name is ‘Creation’ or ‘Island of the time of Re’, which tells about the Egyptian creation myth of the place where land rose above the Waters of Chaos in the beginning of Creation. 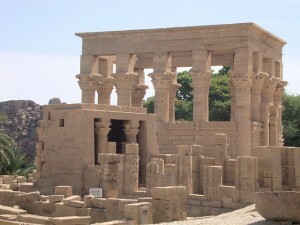 The Philae Island was once home to several monuments of various eras, extending from the Pharaohs to the Caesars. It was a religious centre from the 25th Dynasty well into the Christian era. It attracted pilgrims from all over the ancient world. However, the monument that until these days fires ones imagination most is the Temple of Isis. The Ancient Egyptians built a beautiful and magnificent temple on this island for the Goddess Isis. It was the last temple built in the classical Egyptian architectural style. Construction began in approx 690 BCE. 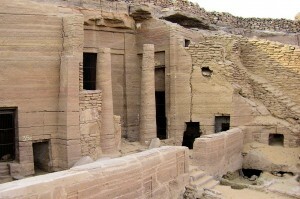 The temple however became submerged after the first Aswan dam was built in 1906. It was not until the seventies that many nations attempted to save the Temple of Isis. All these countries, together with UNESCO, selected a suitable place, but they had to wait until the completion of the High Dam, in 1971, which would stabilize the level of the water around their chosen island. The new island was called Egilica (also called Agilika), and it was completely reshaped to imitate Philae Island as closely as possible. Firstly, a cofferdam was built around the Temple and the water was drained. Next, the temple was dismantled and transferred, stone by stone, from the submerged Philae Island to the redesigned Egilica Island. Each and every stone had to be numbered, and then replaced, in the same position, in the new location. It was a massive, and very complicated, project taking over 9 years to be accomplished. A lot of other temples were relocated too. They dot now the shores of Lake Nasser. The Temple of Isis was reopened in 1980! You can see the submerged original island a short distance away, punctuated by the steel columns used in the moving process. 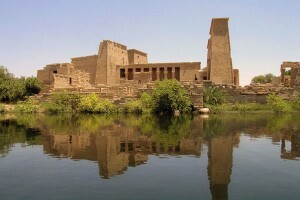 The largest and most important temple on Philae is the great Temple of Isis, which is oriented south to north. It was the centre of the goddess Isis and her connection with Osiris, Horus and the Kingship, during the Ptolemaic Period of Egyptian History. There are many legends connected to Philae, but the most well-known one tells the story of how Isis found the heart of Osiris here after his murder by his brother Seth. The construction of the Temple of Isis began during the reign of King Ptolemy 2. Other Ptolemaic Kings contributed by adding more parts to the main temple. The temple is built in the same style as the temples of the New Kingdom, as well as some other elements, which appeared in the Greco-Roman period, such as the Mamissi (Birth House), and a Nilometer. The Temple of Isis consists of the 1st Pylon (45,5 m wide and 18 m high), which is a great traditional pylon with two towers, and a central doorway, which leads to the 2nd Pylon. On the left side of this court is the Mamissi, which has scenes depicting the birth of the God Horus by his mother Isis. The east colonnade is unfinished, with only 6 of 16 columns completed. The others are roughly hewn with unfinished capitals. In the rear wall of the east colonnade are five doors which led into various chapels. The west colonnade is 93 m long and has 31 (originally 32) plant columns (5.1 m) high, with capitals in a variety of forms. From the colonnade a subterranean staircase leads down to a small Nilometer. The 2nd Pylon (32 m wide and 12 m high) leads to a Hypostyle Hall with 10 huge columns, which symbolize the first plants, trees and flowers of the Earth which began to grow on the Primeval Mound (symbolized by the temple floor). On the ceiling (representing the sky) are images of the Day Boat en the Night Boat, and of the vultures of Upper and Lower Egypt. Finally, there are 3vestibules leading to a sanctuary. The Kiosk of Trajan dates back to the Roman Imperial Period, but was left unfinished. The architraves are supported by 14 columns. The capital of the plant columns were intended to be surmounted by sistrum capitals. Inside the Roman emperor Trajan is depicted making offerings to the Egyptian gods. 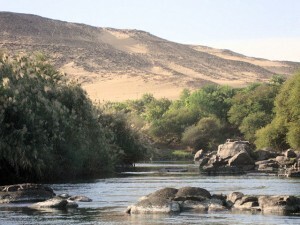 The Island of Sehel is a small and beautiful island in the Nile, about 4 km south of Aswan. It is famous for the granite boulders, strewn over several areas of the island, which have inscriptions written on them. The more than 250 inscriptions are mostly carved on the great surfaces of the rocks or bruised onto the jumbled mounds of granite boulders. These inscriptions were originally written by travellers, who inscribed them while they headed for their journey towards Nubia or while they returned. The inscriptions on the rocks of the two hills which dominate the south-eastern end of the island are mostly dedicated to the goddess Anukis and her consort Khnum. These date from the Middle Kingdom to Ptolemaic periods. On the western part of the island are some well-preserved and beautiful hieroglyphic inscriptions that are dedicated to Khnum, Anukis and other deities, and several royal cartouches. As you climb the hill to the top you have a spectacular view over the cataract area to the south. Some of the famous inscriptions give a record of many ancient facts and historical events like the famous Famine Stela, which is on the summit of the eastern hill. It tells a story of the 3rd Dynasty, during the reign of Netjerikhet (Djoser). The Nubian people living on the island are very friendly and hospitable offering cups of tea galore in their Nubian homes. The local women will happily show you their basket with hand-made crafts, carved dolls and beaded jewellery. This mausoleum has been built in honour of Sir Sultan Mohammed Shah Aga Khan 3, one of the founders of the All-India Muslim League. Aga Khan 3 was the 48th Imam of the Shia Ismaili Muslims. Though this spiritual leader died in 1957, his mausoleum still stands and can be seen above the white villa where he once lived. It is a very elegant pink granite and calcareous sandstone structure. The interior of the building features light colours and gloriously red carpet. The entrance to the mausoleum requires a hard climb on a stepped path, followed by an esplanade from which a flight of steps come sup. The mausoleum is visible from the outside, although often closed to the public. So, check for available times to see mausoleum. Daraw is situates about 20 km from Aswan. 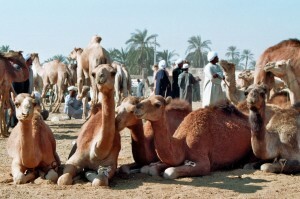 The camel market is one of the biggest from Egypt. Camels are sold and bought each day of the week, but the main caravan of camels, sometimes as many as 2000 of them, is brought to the market on Sunday. Most of the camels come from Sudan in caravans that cross the desert in a 40 day trip up to Abu Simbel, where they are trucked the remainder of the way. Like dates, camels are Allah’s gift to the desert peoples. The camels provide transportation, strength, nourishment, shade, fine wool, and thick, tough hides. The Fatimed Cemetery is located over a small hill and has a number of low mud brick domed and vaulted square buildings, dating back to the 10th century. The Fatimids ruled Egypt until the 12th when replaced by Saladin. Some of the mausoleums clustered to the back of the cemetery go even back to the Tulunid Period or the 9th century. The tombs are very attractive, with roof corners protruding like horns, as well as in bad shape. In a poor attempt of preservation, inscriptions were removed from the tombs, but without recording what came from what. As a result, the dates and names of tomb owners have been lost forever. However, it still is a attractive place, as there are graves from so many centuries, that this single place show the development of Muslim graves up until now. The High Dam of Aswan is a highly important piece of infrastructure. The work began in 1960 and the completed dam was opened in the spring of 1971. This gigantic building is 111 m tall, about 3.8 km in length and 980 m wide! The dam width at the top is 40 m. It has a hydro-electric plant, with 6 turbines, capable of producing 2.1 million kilowatts. The High Dam provides Egypt with water and electricity, and secures the country from the risk of the destructive inundation of the River Nile. As a result of its construction, a great lake was formed, Lake Nasser, which is about 10 km wide in some places, and 500 km long, extending between Egypt and The Sudan – the worlds largest man-made lake! The Kiosk of Qertassi is a little Roman kiosk, dedicated to the goddess Hathor. It has two remaining Hathor headed columns and four other columns and capitals are in the lotus blossom style. The structure consists of a single Hathor court oriented north or south. Originally it was surrounded by 14 columns connected by screen walls. Of the 14 pillars, only 6 have survived in place. The columns were made of brown sandstone. This charming Nubian Monument has been moved from the original site of Old Tamis to New Kalabsha site, near the High Dam of Aswan to save it from the rising waters of Nasser Lake. The history of the Monastery of St. Simeon dates back to the 7th century. It was one of the largest Coptic Monasteries in Egypt. While still in use it housed 300 monks, and could in addition receive up to 100 pilgrims at a time. This fortress monastery originally had a 10 m high wall, with towers which were used as lookout posts against enemies. It survived long as a Christian stronghold of southern Egypt. The monastery was rebuilt in the 10th century, but destroyed by Saladin in 1173, who feared that it might serve as a refuge of marauding Christian Nubians who made forays into southern Egypt. There are still some remains of early Coptic painting on the walls. Arches within the towers also demonstrate an early form of ventilation. Tomb 25/26 of Mekhu and Sabni (6th Dynasty) – reliefs show the murder of Mekhu and the invasion of his son in Nubia. Tomb 31 of Sarenput 2 (12th Dynasty) – one of the most beautiful and best preserved tomb. Tomb 31 of Khunes (6th Dynasty) – contains scenes of the deceased and his family in daily life. Tomb 31 of Harkhuf (6th Dynasty) – famous for Harkhuf’s biographical text and a copy of a letter from Pep1 2. Tomb 35 of Pepinakht (6thDynasty) – tomb with a columned façade, biographical texts and reliefs showing hunting and bull-fighting scenes. Tomb 35 of Sarenput 1 (12th Dynasty) – hunting and fishing scenes, daily life scenes, a boating scenes and a biographical text with painted hieroglyphs. On top of the hill above the Tomb of the Nobles you’ll find Kubbet el Hawa or Dome of the Winds. It is a small domed shrine of a local sheikh and holy man, which gave the hill its local name. 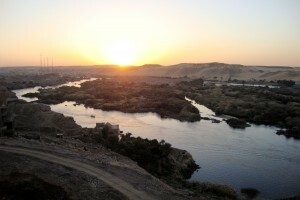 The climb is rewarded with amazing views all of Aswan, the Nile river and the desert. The Unfinished Obelisk lies, in its original location, in a granite quarry in Aswan. It is the largest known ancient obelisk, carved directly out of bedrock. It is 42 m in length and was most probably abandoned when some cracks appeared in the rock, during its construction. It is believed that it was constructed and abandoned during the reign of Queen Hatshepsut (18th Dynasty). If finished it would have measured around 42 m and would have weighed nearly 1,200 tons. During the earliest ages, the Ancient Egyptians knew the so-called ‘Pn-pn’. This was a pyramidal stone with a pointed top. According to ancient Egyptian beliefs the ‘Pn-pn’ symbolized the primeval hill from which the world first appeared. Then, in the course of time, this ‘Pn-pn’ evolved to be an obelisk usually made of granite with a pyramidal shape on top. The obelisk, being a sacred symbol of the cult of the sun, began to play an important role inside the temples of Ra during the 5th Dynasty. Obelisks were erected on a great base in an open court. Asthe suns rays fell on its pyramidal top, the bright light filled the Temple, giving the people a symbol of the power of the sun.